The 2017 London marathon saw a record number of competitors taking part, with more than 40,000 people making it to the start line to take on the grueling 26.2 mile run. Marking this year’s event the biggest London marathon to date, with 1,242 more runners than last year. 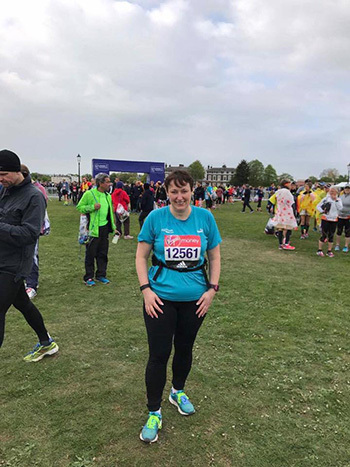 Maria Quigley, Sales Manager at the Skiddaw Hotel in Keswick was one of the many thousands to take up the challenge, running the first 13.1 miles in 2 hours and 28 minutes, completing the full course in 5 hours and 22 minutes. By doing so, Maria has helped to raise an impressive £790 for our charity of the year, Blood Bikes Cumbria. We are all very proud of Maria, in between her busy schedule of work, being a full time Mum and wife, she still managed to find the time to put in many hours of training. WELL DONE Maria.